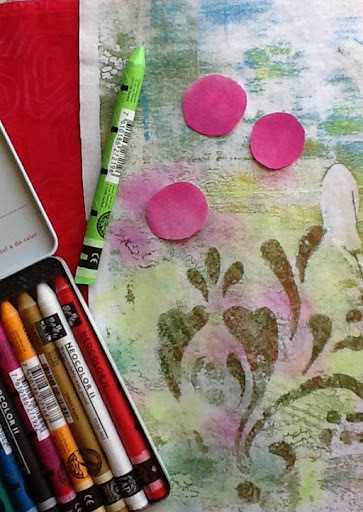 It's not only yard work that gets in the way of art making; there's spring cleaning too! 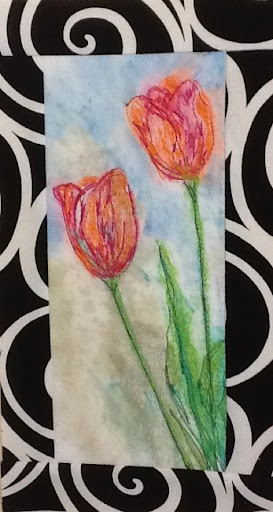 I did some cleaning this morning, taking time in between to do a little fabric painting. I got a bunch of new screens from Margaret Applin and I've been anxious to try an idea that I had. 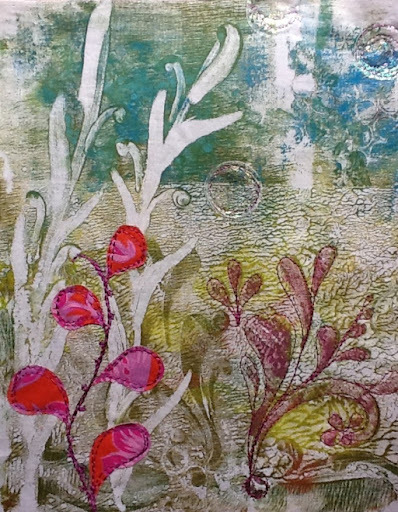 I screened a few images onto fabric using acrylic matte medium as a resist. 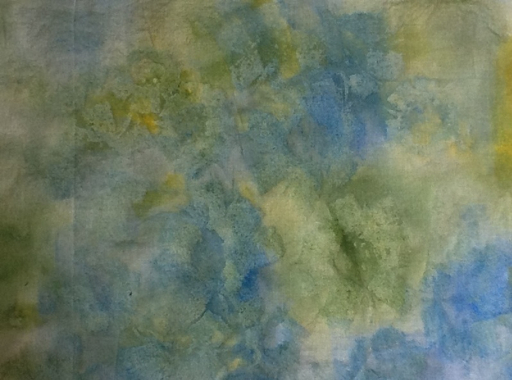 I let them dry and then sponged on transparent fabric paints. 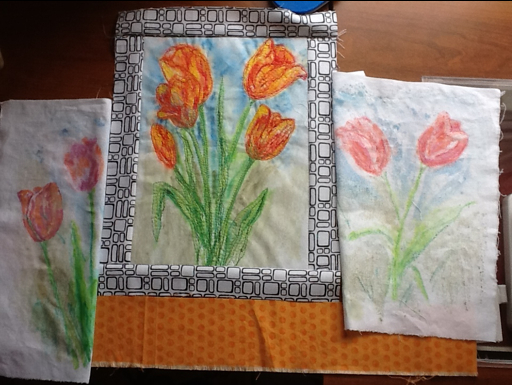 Since this method works on paper, I decided to give it a try on fabric. As you can see above, when wet, it looks good. The effect fades as the fabric dries and fades. There is still some texture but the definition is lost. I will try it again, making sure to coat well and letting it dry longer. I definitely need to use more saturated paint. Here is another sample just after painting it. It looks so good, but again, faded a lot. Better than the First one though. Definitely usable, perhaps with more layering. 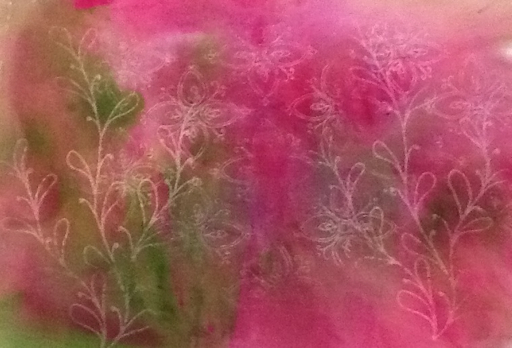 Here is another design again wet and saturated. It looks so good, but fades as it dries. It will take a little more experimenting to get it right. 1. Apply enough matte medium. 2. Make sure matte medium is well dried. 3. Use a heavily saturated transparent paint. I used Setacolor. The last few days have been so beautiful that we've just wanted to be outside all the time. My husband helped me get the front yard raked and get the gardens spread with mulch. My gardens at the back are still frozen so those will wait. Today, after getting some housework done and meeting friends for coffee, I did a sewing repair to a blouse and finished up my zippered bag. Then I got out my fabric paints and added some lighter color to areas that were previously printed with paint for more contrast. For supper, I made what I'm calling a Southwest pot pie. It's basically a vegetarian stew with corn and black beans added and a cornbread crust topping. 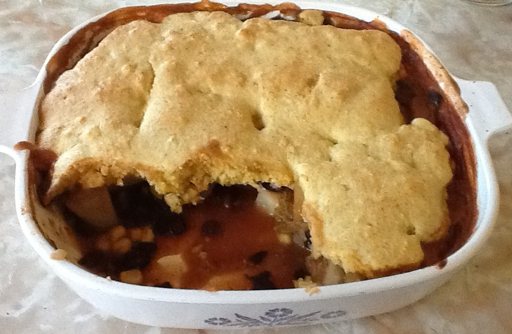 The stew I created myself; the crust, I found on line. I was so anxious to eat that I missed taking the shot of the dished up stew! This morning I did some paperwork. I'm working on another article to come out later in the summer, I think. 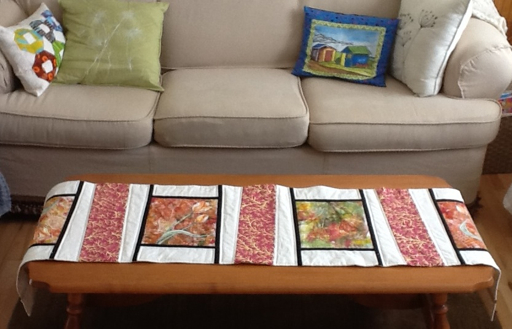 Then I had lunch with a friend, sewed a bit, went for a walk and did a few minutes of tidy work in the garden. We've still got some patches of snow, especially in the backyard, but I will be able to start raking and mulching. I put the zippered pouch together though I still have to cut the zipper and make the tab. I gave it a press and top stitched the edge; however, I'm not perfectly happy with it. You can see if you look closely that there seem to be tiny puckers along the lining edge. I like things to look neatly done if I'm selling them, so I plan to pick out the stitches, give it a good press and do it again. Since I wanted to get outside, I left it for today. The bag measures about 7" by 11" with a depth of about 3 1/2" at the bottom. It's a fabulous day out there today! Finally, feel like spring is really here. This morning I transplanted all my little tomato and Swiss chard seedlings into larger pots. My husband was working close to home today, so we had lunch and went for a walk. 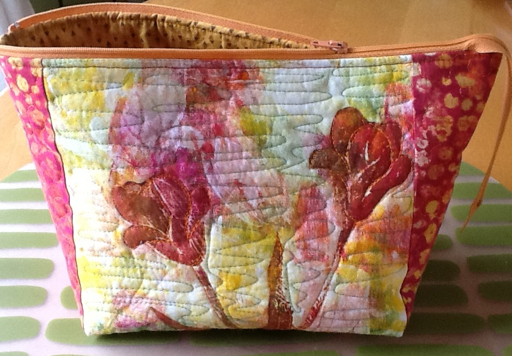 I've just finished free motion quilting the front and back pieces for another zippered bag. The zipper is pinned in place and ready for the next session. 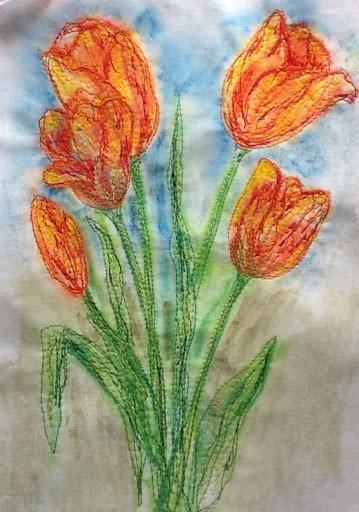 I did a quick bit of free motion outlining the tulips and then filled in around them with straight-ish lines., nothing fancy as its notva piece of wall art. It must be functional. I really like putting my art into usable items sometimes. Now, I'm off to make a tea and sit for a bit with my knitting. I was lazy getting out of bed and getting going this morning after a busy family weekend. 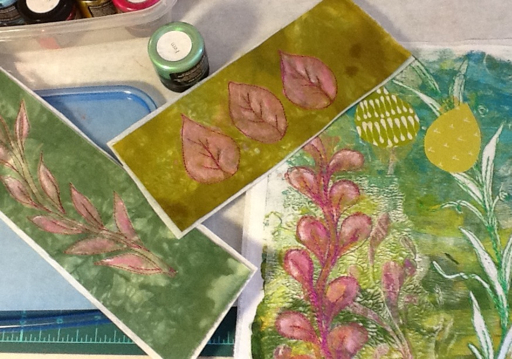 I had a few chores and a couple of errands, so my studio time today was limited. 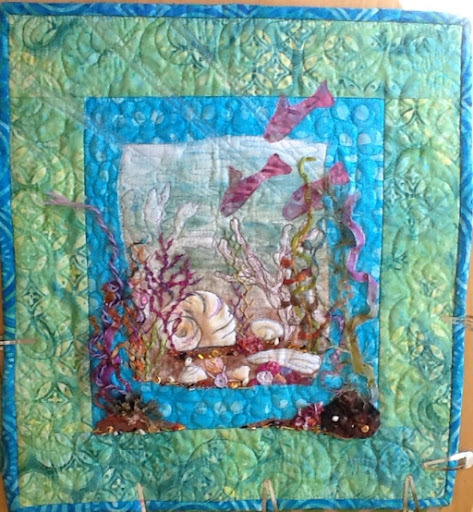 I've decided to say enough to my ocean piece. I sewed the binding onto it and as soon as I'm done writing this, I'll hand stitch it down. 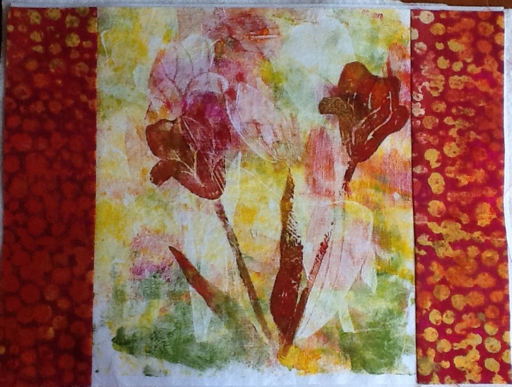 I took one of my tulip prints, added side borders, and cut a stabilizer and a batting to get it ready to quilt. i plan to make it into a zippered pouch. I'm just going to sit down with a tea and do my little hand stitching chores. I had a few minutes between appointments this morning and have to go out this afternoon. One of the quickest things to do when you have a snippet of time is to pick up pencil and paper. Sketching is relaxing too, adds a bit of zen to an otherwise busy day. It's not 100% finished. I can see a couple areas i need to go back to with shading. 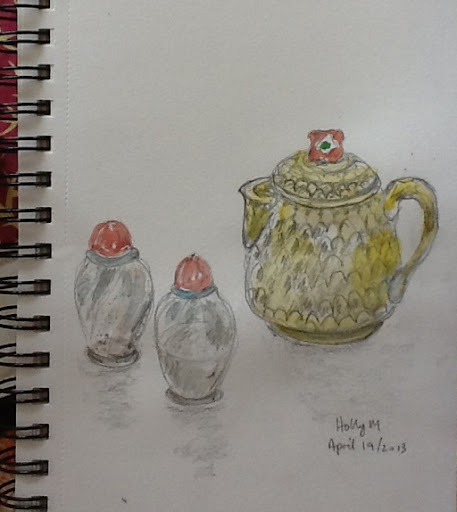 Done in my plain paper sketchbook with a tiny touch of watercolor. Doodling is freeing and mindless, but sometimes it's fun to sit down with something to concentrate on, to let your eyes and mind wander the contours, looking for line and form and shading and highlights. My intentions this morning after meeting some friends for coffee, were to do a couple of household things, maybe do a little mundane sewing, like finishing a binding and sewing on a label and then getting in a walk this afternoon. Instead, I started moving pieces around on my design wall. 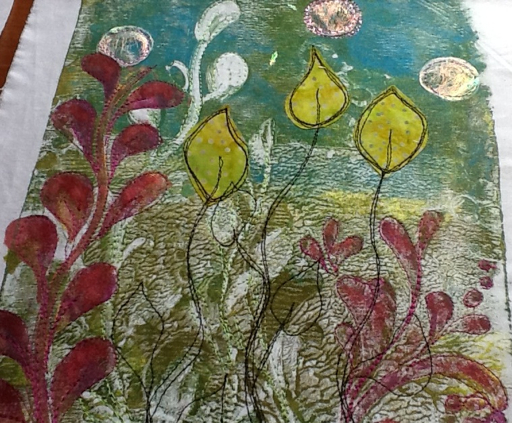 I decided that it needed something, so I headed to my printing table with a few hand dyes and my stamps. I did some discharge prints. 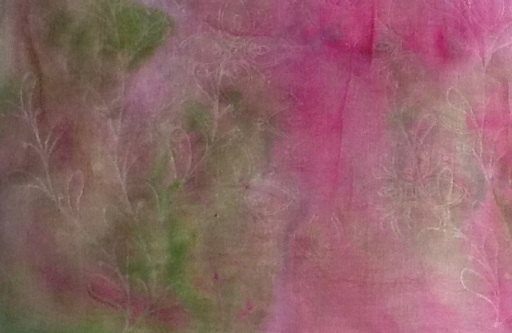 My friend, Anne, donated some pieces of silk fabric that she wasn't going to use and when I went to add them to my stash of silks, I decided that the colors worked. This will be like a puzzle where I am continually moving and adding parts until I'm satisfied. I still have thread painting to do and I'll be highlighting some colors with brighter, richer paints and Paintsticks and maybe even adding in some foils for sparkle. I know, there's too much dark in the bottom left. That'll change. I haven't decided yet if I even like the piece, but I am experimenting and caught up in it, so we'll see where it leads. I awakened this morning heavy headed, achy and saddened by the events of the world. It is my day to do my lap swim so I made my tea and drove my husband to work. At the spa, I was rewarded with the sun shining through the windows and sparkling on the water. I was alone in the quiet salt water and sauna for most of my visit. I've had a snippet of time to dabble with my art pieces, adding some colour to one with the Neocolor II crayons and I cut out a few circles to fuse onto it. 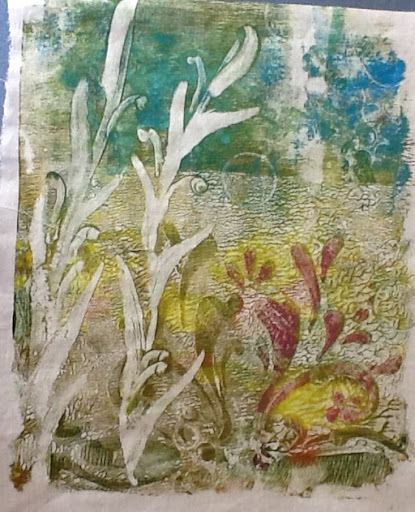 This was a print that dint take the paint well and there was a lot of white. And I cut out one more little leaf to add to the one I was working on yesterday. 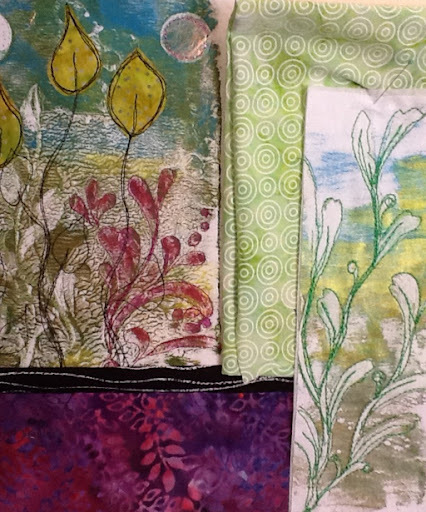 I don't have time to sew today, but it feels good to walk in the studio and make even a few little pieces. This afternoon, I'm going to tutor my adult student who is studying to finish her high school. I enjoy working with her as she is upbeat and determined. We get on well together. 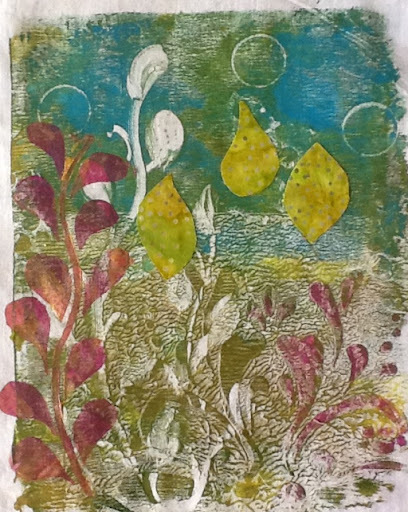 Here and there, in between car appointments and walks, I've been working away at my Gelli prints. This is a slow process for me as I add and take away bits and pieces. I'm trying to think of a name for the piece too. I like the idea of tangled garden but I believe there is a painting by that name. 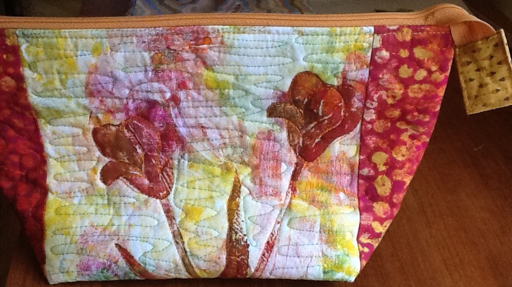 This morning I decided I needed a little more color, adding some fusible appliqué. 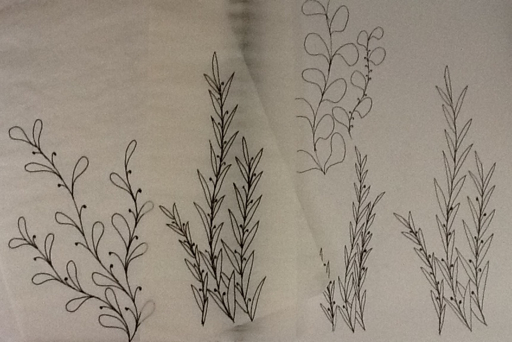 What I noticed afterwards was that the two side by side are plants are the same height, so for variety, I'll go back and add another fusible leaf for some added height. This is definitely a work in progress and once I get it pieced together, I will enjoy adding some hand stitching and embellishing. 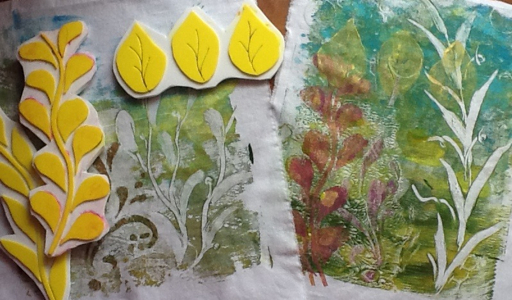 I had a little time today to add more free motion stitching to the gelatin mono prints. Yesterday, was cut short when I got a call that my husband was being taken by ambulance to the hospital after passing out at work. It's never happened to him before although he does get atrial fib and has a slow heart rate. Everything checked out fine though, do it may have been the fact that it was a special job his company did for a power plant shut down. He was on his feet early and went too long without food or drink. I rather like these prints and I'm thinking I might like to incorporate them into a small hanging. 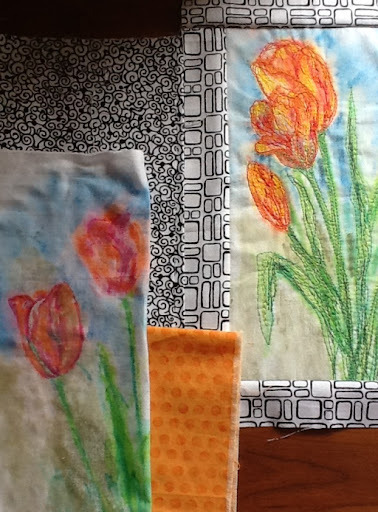 I've tacked a couple up with a couple of fabrics to live with for a bit. Once I get more stitching added to the others, I'll see. Once I get more stitching added to the others, I'll see. Here's a bit of a detail shot on the first one. Well, I sure hope this is winter's last gasp! We are getting about 15cm's of snow! 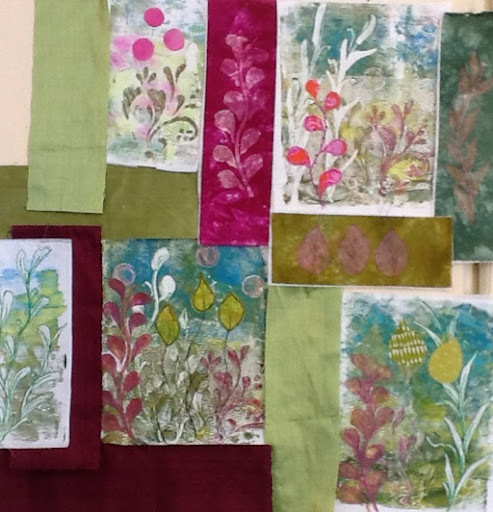 I got up this morning with the intentions to do do a bit of doodling so I could send my final screen designs off to Margaret Applin. I started over breakfast with my tea. I got so absorbed that then I had to make a few foam stamps. And I couldn't stop there. 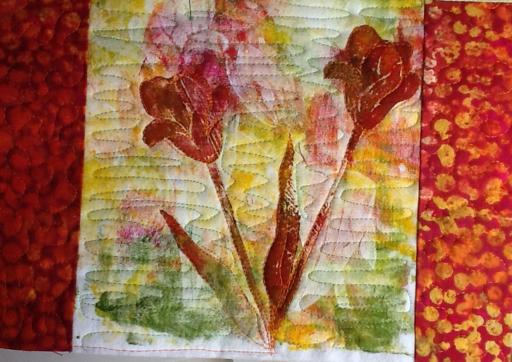 I had to see how they would look on fabric so I hauled out my fabric paint and the Gelli. I did 4 prints because I had to stop for lunch by then. 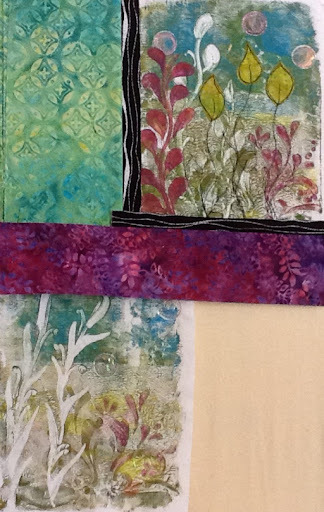 So I cleaned up, ate lunch and then started stitching. Still a bit more to do but a good place to stop for today. I think the extra cortisone I've had to take for my cold has given me a little zip. Wish I was like this all the time but one has to go with the flow. 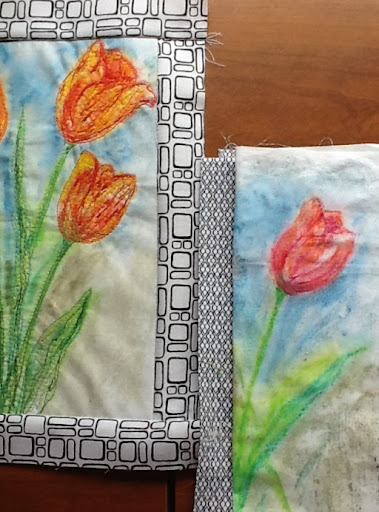 Today, I decided to take a little break in between my fiber art work to do something a little different. I've been looking at rigid heddle looms for a while thinking it might be fun to be able to weave the rugs that I like to keep at my doorways. When I came across a tutorial yesterday on how to knit a rug, I thought I'd give it a try. In the tutorial, she mentions that it might have been better to cut the fabric strips at 3/4", so that's what I did. I used a size 8mm circular needle with 42 stitches. It might have been easier to knit with the recommended 10mm needles but I do like the density of it so far. It measures about 18" wide and I can see at this point that I'm going to need to cut up lots more fabric. 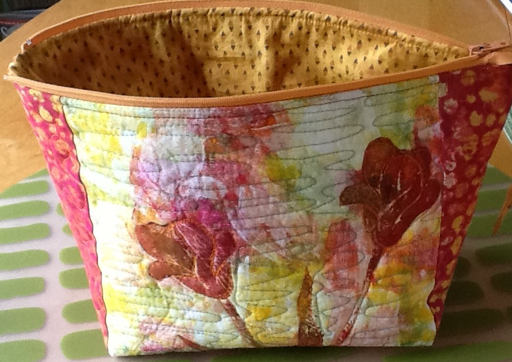 It's a great way to use up the pieces of fabric stash that don't appeal anymore. Tomorrow, I'll be out most of the day-- dentist, lunch and tutoring so I'll catch up again on the weekend. 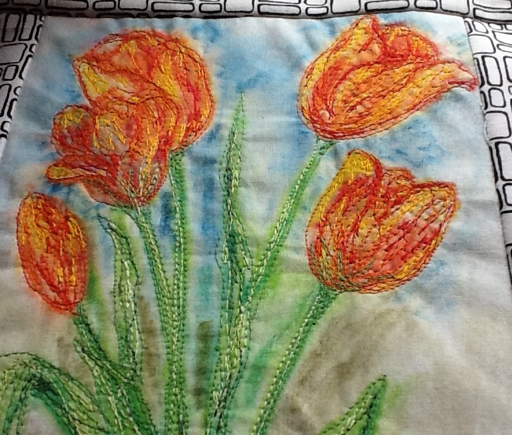 Since I didn't go to my usual lap swim this morning due to my chest cold, I spent the time in my sewing studio adding some thread painting to two more tulip pieces. I'm feeling kind of ambiguous about them, not sure if they should go together in one hanging or stay separate as small individual ones. This last one I'm rather partial too. You'll notice on the first smaller one, that I chose a black with white border as opposed to the white with black that are on the other two. This makes it stand out so I will need to either balance it out or change it if I want to put it with the others. At this stage they may sit on my design wall for a while while I move pieces around adding to it and deciding what to do with them. Margaret Applin's DVD that I down loaded and wrote about yesterday was so inspiring that I couldn't wait to get out my paint and brushes. I'm currently having some screens done by her, so I thought why not add to them while I'm paying the postman. These are a couple of ideas I worked on. 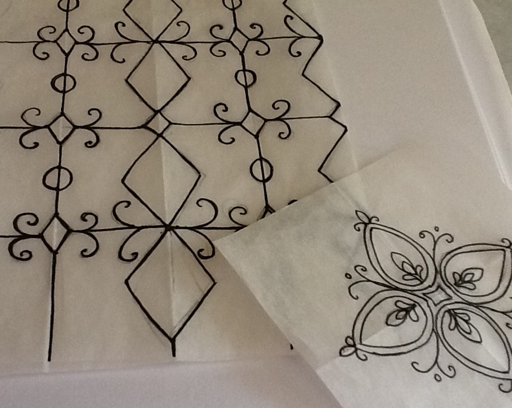 The one on the left was inspired by a sketch that I did a few years ago of a wrought iron fence. The little medallion on the right was inspired by moroccon designs that I googled one day this past winter. 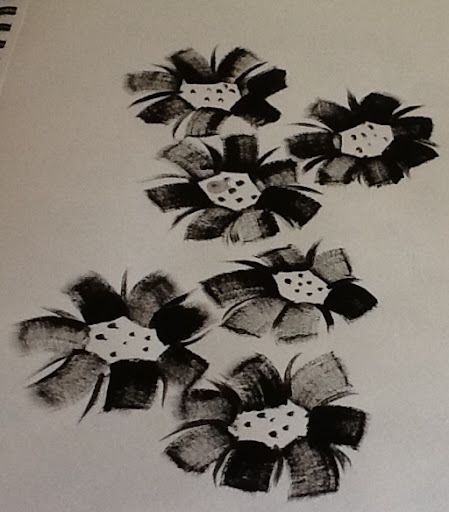 Then I got out my paint and brushes to try a few flowers. I can't decide if I'll go with a grouping of three or an all over page design. I'd probably get more use out of the full page as I can isolate parts of it. 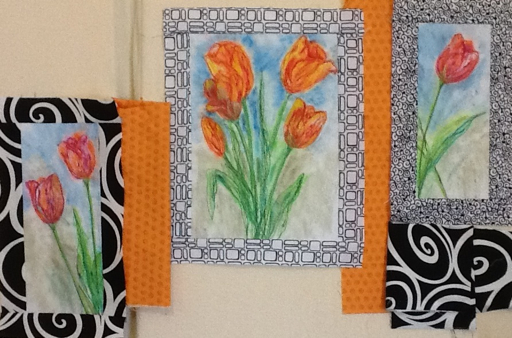 I also added a bit more paint to two of the tulip prints I did the other day. 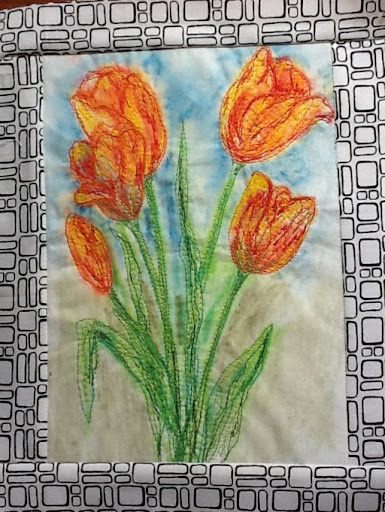 I think it might go into a tulip wall hanging along with the third piece shown below. I'll get them stitched and then well see how it fits together. Here I am again wrapped up in a blanket on my sofa wishing for nicer weather, better health and thinking about lots of creative things to do. I got an email notice of the new DVD by my blogging friend Margaret Applin from Scrap Wisdom Collage and I immediately downloaded it from here. With the cost of shipping today, the download is about half the price. I've watched about half of it so far and it is fantastic! I'm pretty familiar with using a lot of her mediums and techniques but boy there was still lots of new stuff that I had not seen nor thought if and lots of inspiration! I highly recommend it for beginners or advanced artists. Lots of fodder to draw from and inspire you to create your own personal images. This is money well spent! My sore throat and cough have actually been daily getting worse. It's been a week! I went to the clinic this morning but it was so full I left. I know what the doctor would have told me anyway. I guess i just wanted confirmation that my dosing was OK with my Addison's. I bought more cough medicine and came home. 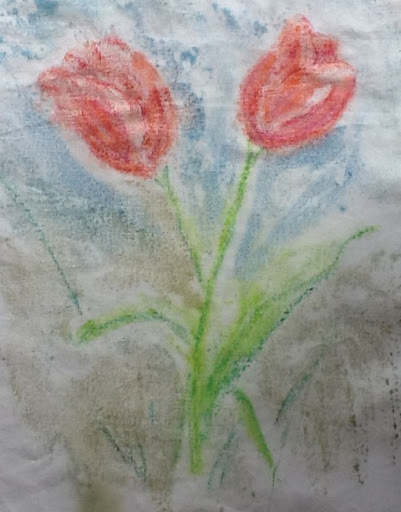 I'm itching to paint and print some more but that's getting too physical for me right now, so I sat down at my sewing machine and thread painted on one of my tulip designs. I added a quick 1 inch border to see how I liked it. It's pretty plain and simple. I want to play more than this but sitting at the machine is what I can do right now. I did lay it out with a small swatch of orange polka dot and the other un- worked prints just to see if a larger piece might be an idea. Margaret's DVD has given me lots of ideas for new work. Now I just have to get better. 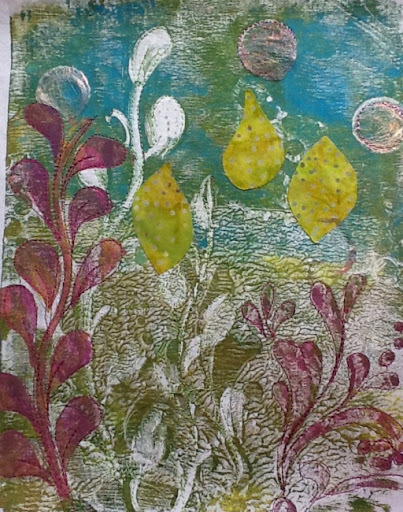 I can see I wil have to get out the fun foam for more stamp making though. I can do that sitting down. It's bright and cheerful anyway and helped me pass the time and forget about my sore throat. Funny how art can captivate us mentally and physically like that. I'm curled up under an afghan on the sofa as I write this. My husband went to visit his parents on his own as I didn't want to take the chance of passing on a cold. I've been lucky that it has only manifested as a sore throat, a bit of a cough and some shortness of breath. About this time of day, I get achy and so I just take a Tylenol arthritis and rest up. I sat at my machine long enough this afternoon to do the quilting on my runner. I kept it simple and now I can enjoy it on my coffee table while I read. A couple of months ago I bought some Inktense crayons and I've been wanting to test them out. I've had the pencils for a while and really love the vibrant colors. 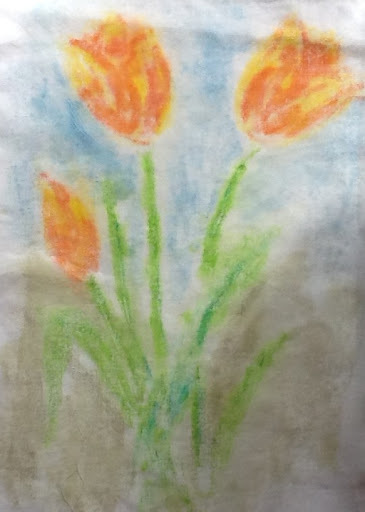 I tried drawing on a couple of surfaces which I then spritzed with water, covered with a piece of white cotton, and rubbed. 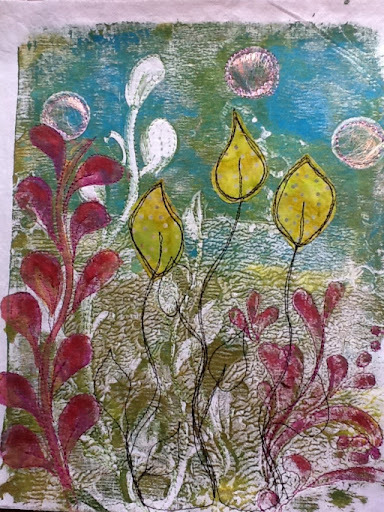 The best surface to hold the pigment was a piece of linoprint board. I've got a piece of plexiglass that I use for numerous things that I'm going to take into the glass shop and ask if they'll sand blast it for me. Im hoping that will grab the pigment even better. I still find the color a little pale but I can go back and work into it. Stitch work will bring it to life as well.